SAN DIEGO (KGTV) - Navy veteran Erick Dorsey is the proud new owner of a 2015 Toyota Tacoma, a vehicle once totaled and headed for the salvage yard. The donation is part of the National Auto Body Council's Recycled Rides program - insurers, collision repairers, paint suppliers, parts vendors, and others collaborate to repair and donate vehicles to deserving individuals throughout the country. After leaving the service in 2010, transitioning and finding employment as a civilian was challenging for Dorsey. He relied on his previous skill-set as a welder to make ends meet, a career that nearly cost him his eyesight from being in the trade for over 20 years. Dorsey's currently a full-time student at Cuyamaca College, pursuing environmental science. He's also working as a Veteran Resource Center representative through the VA Work Study program. While he transitions to a new career with limited income, Dorsey relies on public transportation and friends to juggle work and school schedules. Allstate Insurance donated the car and technicians at Caliber Collision in Vista made it like new, volunteering personal time to restore the vehicle. 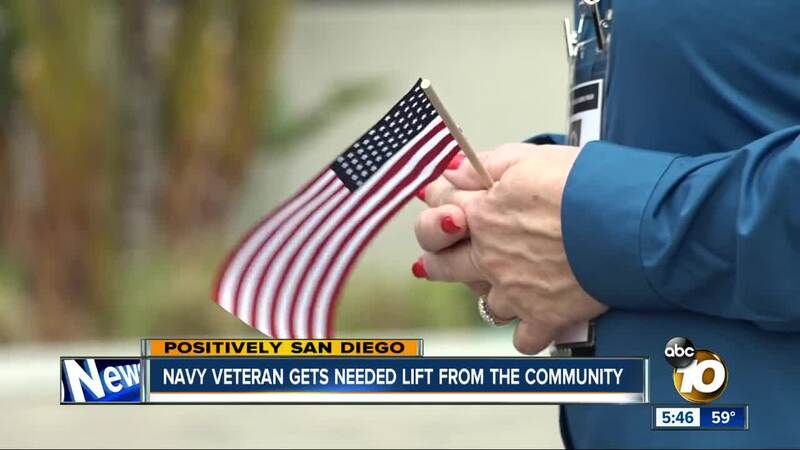 Dorsey was nominated by Support the Enlisted Project (STEP) , a San Diego-based nonprofit that supports military service members and their families. STEP's mission is to build financial self-sufficiency among junior active duty enlisted service members and recently discharged enlisted Veterans and their families. Over 1,000 vehicles have been donated through the Recycled Rides program since its inception in 2007.